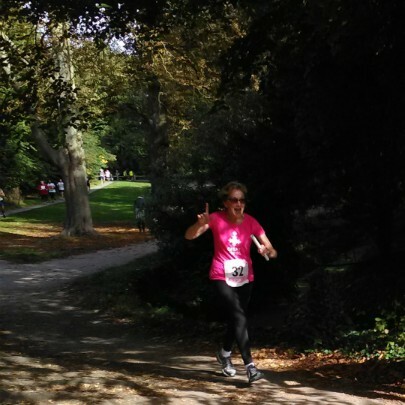 Newnham College Principal, Dame Carol Black, ran as part of a team of distinguished women in the weekend’s Chariots of Fire race – raising over £11,000 for disadvantaged children in Cambridgeshire. The ‘Great Dames’ to run this year included Newnham alumnae Dame Sue Owen, Permanent Secretary in the Department of Culture, Media and Sport, and businesswoman Dame Louise Makin. The ‘Great Dames’ team was set up by Dame Mary Archer, former chemistry lecturer at Newnham. As a physician, Dame Carol has long been a champion of the importance of exercise for both mental and physical well-being. And, as this photo shows, running also brings her huge pleasure. With the Principal’s example of fitness and determination, it’s no surprise that Newnham’s boat crew has done so well in recent years. With the College’s new rooftop gym in the Dorothy Garrod Building, all members of Newnham will have excellent facilities to stay healthy, and develop their strengths.